Home OPINION THIKA TOWN CONSTITUENCY: Who will it be? Eng. Patrick Wainaina Wa Jungle, Hon. Alice Wambui Ng’ang’a and George Muritu Gathecha. 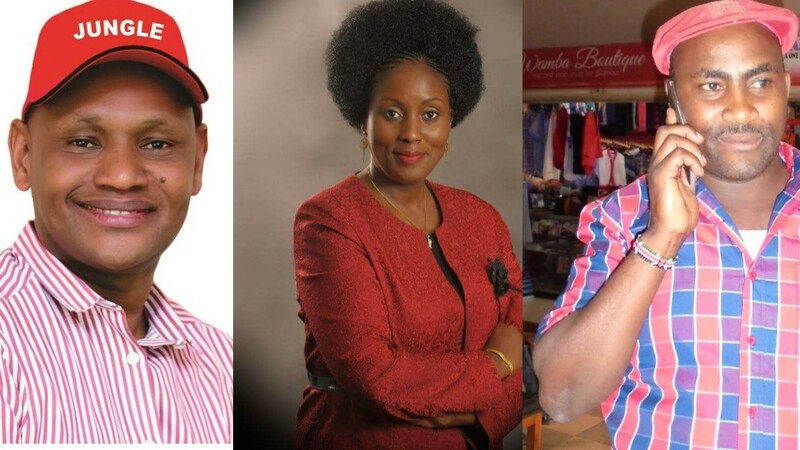 The three candidates eyeing the Thika Town Parliamentary seat tomorrow. With barely less than 24 hours to the 2017 general elections, the Thika Town seat has promised to be one hell of a battleground. This seat has attracted three contenders namely; incumbent Alice Wambui Ng’ang’a (Jubilee Party), Eng. Patrick Wainaina Wa Jungle (Independent) and George Muritu Gathecha (Maendeleo Chap Chap). All indicators show that tomorrow’s duel will definitely be between Hon Alice Ng’ang’a and Eng. Wainaina after pundits have dismissed Gathecha’s candidature as a none-starter after he fizzled out with time and went underground. Locked into probably what promises to be one of the most competitive elections, this race has drawn great interest both within and without the constituency due to the publicity it has attracted, especially after Eng. Wainaina decamped from Jubilee Party following a narrow defeat in the nominations. The businessman has since marshalled all his energy and resources to beat the odds, giving the incumbent and the JP leadership some sleepless nights. 147,323 votes are up for grabs with all eyes trained on Kamenu Ward with 51,497 registered voters, Township (42,807) and Hospital Ward (32,284). The candidate who will manage to scoop majority of this votes will definitely carry the day. Gatuanyaga and Ngoliba Wards have 11,462 and 9,273 voters respectively. Several key factors will be key to victory for the two main contenders. To help us get close to knowing who will be Thika’s next MP, we will try to analyse each contender’s chances. The incumbent will be riding on President Uhuru Kenyatta’s party ticket of Jubilee with a lot of hope in a 6-piece vote pattern. If Thika electorate will vote for Jubilee candidates as opposed to individual candidates, Alice is very likely to carry the day. She has also endeared so well with the women folk especially those above 30 years of age who credit her with the issuance of bursaries for needy students. There are those who prefer her for her firebrand politics with a few saying that they will vote for her because of gender parity. Those who were against her candidature have accused her of being arrogant and not easily accessible. They also accuse her of deserting them only to resurface whenever there was a crisis or to fight Kiambu Governor William Kabogo. She is also blamed for fighting projects initiated by her opponents through her influence with the authorities. Wainaina is banking on his record on development projects with majority of his supporters saying that he is best placed to create jobs to fight unemployment in the constituency. There were those who believe that he is a down-to-earth person who is quite accessible. The school of thought that he was robbed of his victory in the Jubilee Party primaries is also working in his favour with majority of his sympathisers saying that they will vote him in to prove a point to the party hierarchy. Wainaina’s strongest support base include the youth, men, the elite and the business community. He is also a favourite among the ‘diaspora’ voters (people from communities though to have migrated to Thika) and Kenyans of Asian origin who might prove to be his winning formula. The many people who draw a living from his vast business empire might also tilt the circles in his favour considering that he has employed over 3,000 people directly. However, some of his opponents believe that he is too green in politics and should wait for another time before he can get elected. Others fear that he might be swept away by the Jubilee storm. The Thika seat will be determined on the voter turnout and how each candidate will have galvanised their support to the people during the campaign period. Considering the fact that these elections will be officiated by the IEBC, it will be very hard for anyone to manipulate the results within the polling stations. How well each one of them has sold themselves will be key to victory.